An exclusive day at one of the UK's premier circuits. Ideal for clients and staff, your day will be meticulously planned with you.Together we will choose the options that will give you a day to remember. The day can consist of sprint or endurance racing or a mixture of both. The minimum number of karts is 10 with a maximum of 40 if required. Everything is provided including racing suits, helmets and the latest twin engine pro-karts which are twice as powerful as indoor karts. To enter one of our open team races you need only five people per team. You can enter one or as many teams as you wish subject to availablity on the date selected. The format is 2.5 hour endurance race plus ample practice to familiarise yourselves with the ciruit befoire the race starts. The is a compulsory driver change every 15 minutes giving each driver two demanding sessions in each half of the race. Team members are involved at all times with pit board messages and re-fuelling. The format really is like a formula one Grand Prix with driver patience paying dividends. Team positions are constantly updated on a large electronic board and at the end of the race each team will recieve a print out of all drivers lap times. Teams can be made up of clients, staff or friends for a professionaly run event that has been one of our most popular over the last couple of years. This is an experience you will never forget and one that you will want to repeat. We have many teams that race with us several times a year. 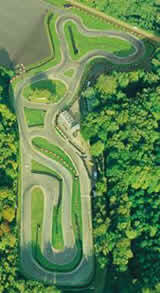 Practice is given to enable drivers to familiarise themselves with the karts and circuit. The race is fully computerised and race positions and the distance between karts will be constantly updated. There is a large electronic scoreboard in front of the viewing area. The karts are high quality twin engine 200 cc Bowman Pro-Karts with twice the power of indoor karts. "We have suggested other events for our annual client day but everyone wants to renew rivalry on the circuit. It appears there is no other event that gets the adrenalin flowing like Pro-karting'.